Contractor Hammer And Hand's July 12th tour will showcase for the public Seattle's first Passive House, Courtland Place, located in Rainier Valley. Passive House consultants Dan Whitmore and Sam Hagerman will discuss the promise that modern building science brings to Seattle's built environment and the role of high performance remodels and new construction in its transformation. 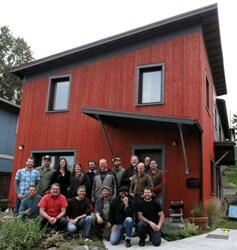 "The beauty of Passive House is its simplicity," said Hammer And Hand's Dan Whitmore. "We're able to eliminate big mechanical systems and gadgetry and instead use modern building science to design and construct super-efficient buildings." Remodeling and building contractor Hammer And Hand - Seattle announced today that it will host a tour of the city's first Passive House, Courtland Place, on Thursday, July 12. Led by the project's builder and Hammer And Hand supervisor Dan Whitmore, the free tour will give participants a first-hand experience of the indoor air quality, thermal comfort, and efficiency made possible by the high performance Passive House building energy standard. "While the term ‘green building' often conjures images of bamboo floors and low-flow toilets," said Sam Hagerman, co-owner of Hammer And Hand and president of the Passive House Alliance US, "the Passive House approach is about revolutionizing how our buildings perform, becoming quiet, comfortable, super-efficient, gracious spaces." 7. Modeling with advanced software. By using these techniques, Whitmore avoided traditional, large and expensive furnace and ductwork at his Courtland Place Passive House. The heat demand of the house got so low that it is heated year-round by an energy recovery ventilation (ERV) unit whose output matches that of a toaster oven. "The beauty of Passive House is its simplicity," said Whitmore. "We're able to eliminate big mechanical systems and gadgetry and instead use modern building science to design and construct super-efficient buildings. Big gains in energy performance become possible at a modest cost." Hammer And Hand's tour of the Courtland Place Passive House. Free and open to the public, but space limited. Hosted by Hammer And Hand's Dan Whitmore and Sam Hagerman. Email seattle(at)hammerandhand(dot)com to reserve a space and receive directions to the site, located in Seattle's Rainier Valley. "Dan's Courtland Place blazed new territory in Seattle's green building scene and we're excited to share the project with the broader community here," said Hagerman. "Happily, this first Seattle Passive House will soon be joined by several others built by fellow Seattle builders and by Hammer And Hand." More about Passive House and high performance remodels and new construction can be found at Hammer And Hand – Seattle's website at http://hammerandhand.com/seattle.